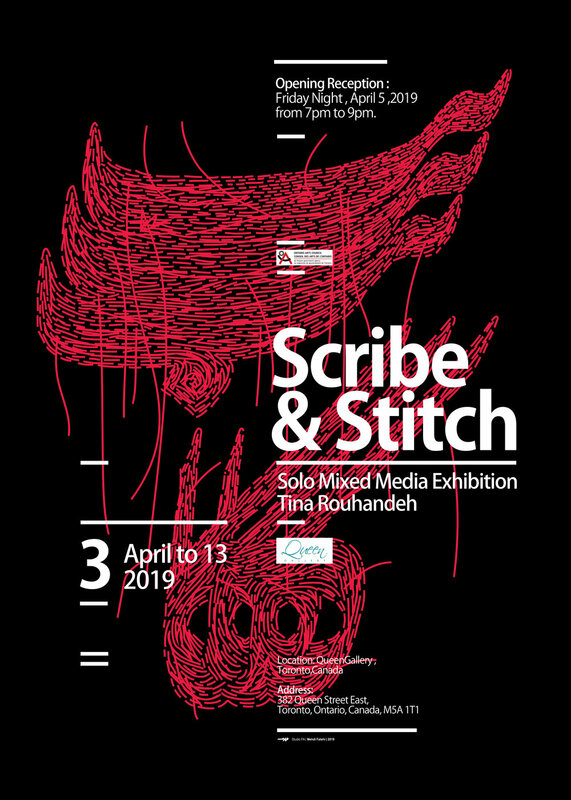 My solo mixed media exhibition, “Scribe & Stitch” has been extended until April 20th,2019. Visit Queen Gallery during gallery hours (3:30-7:30 pm,on Tuesday to Saturday). I am so honored and thankful to be the recipient of the Exhibition Assistace Grant for my “Scribe & Stitch” project. This exhibition represents a valuable next step for my artistic practice in that it will be the first time my work will be shown in Toronto. Scribe and Stitches” is a 20-piece collection of my recent work studying the relationship between Persian Calligraphy and contemporary fiber art. This work is a continuation of recent thematic explorations in the presence of the artist’s hand in both calligraphy and fiber art. “Scribe and Stitches” comprises of numerous wall hanging work, ranging in medium from paper and ink, to fabric, handmade paper and hand stitched pieces. Some of the work is inspired by a traditional, meditative style of writing calligraphy called “black practice” or “Siyáh Mashq.” This practice results in years worth of handwritten pieces that were completely improvised and unrehearsed, during which I was perfecting each letter, and refining each word and how they connect together. This grant is going to assist me and take me one step closer to my career goals. I would like to thank Ontario Arts Council (OAC) to provide support for my personal and professional development.